Wanna have free time for a movie after dinner? Why don’t you buy a Major Appliance? Let Dishwasher does the cleaning for you while you can relax and enjoy your favorite TV Show or Movie. Let’s get started with the list of best economic and quiet dish cleaning machine in 2019. 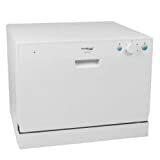 Starting of our list at number seven, the Avanti Model DWE1802SS Built-in Dishwasher is a good mid-sized model that has convenient features and solid performance. For a machine this size, it does offer a decent amount of interior space for dishes. The racks are well designed for easy loading and you can wash just about any dish in this machine. It has easy to understand electronic controls and it comes with four wash settings that include speed, light, normal and heavy. The speed setting is pretty quick and it uses less than three gallons of water, but it is really only good for dishes that are lightly soiled. For things that are little more caked on, use the normal or heavy settings, but they can take upwards of an hour and a half to complete. This machine seems to be made from quality materials and if you take good care of it, it should serve you well for a long time. This dishwasher is sort of between a full-size model and a compact. Its capacity is probably just enough for a small to medium size family, but if you are tight on space, it can be a good solution for just about anyone. This machine works as good as most full-size dishwashers, it can fit in a smaller kitchen and it is easy to use. 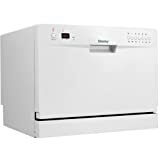 The Danby DDW611 WLED Countertop Dishwasher is a great value for the money. This Energy Star electronic dishwasher is just over 17″ high, to fit comfortably under most kitchen cabinets – yet it will hold up to six standard place settings. The cutlery tray is removable to make room for pots and pans. It’s easy to put together and hook up; a convenient adapter lets you connect it quickly to any kitchen tap. It also consumes little water only 3.17 gallons during a normal wash cycle. It automatically dispenses detergent and rinses agent, and the LED-display controls let you choose from 6 different wash cycles. It’s ideal for a single college student or a couple in a small apartment: it’s quiet, and you’ll have more time to read and relax. Best of all, your dishes will come out shiny and clean! Bosch SHE3AR75UC Ascenta 24 Wide Full Console Built-In Dishwasher is powerful, yet very efficient when it comes to energy and water consumption, this is a Bosch built-in dishwasher every family will be proud to own. It is Energy Star Certified – this guarantees you up to 30% less money spent on energy bills per year. 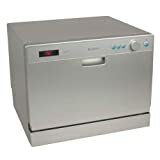 It features a good number of enhancements compared to the basic Ascenta Series dishwashers. It ensures top performance and an incredible clean every time thanks to the new technology used to build it. Its unique features are 1. Super-Quiet Operation, 2. Variable Spray Pressure System, 3. Comes with Functional Detergent and Rinse Agent Dispenser, and 4. Recessed Handle with Self-Latching Door. The SPT countertop dishwasher is a user-friendly unit for your whole family’s dishwashing needs. It will hold up to six standard place settings and offers the power of a full sized dishwasher, but its compact size lets it fit between your cabinets and countertops. It’s easy to set up and it connects speedily to any kitchen faucet, so you don’t need to permanently install it. The controls are simple to use: choose between six wash cycles (heavy, normal, light, glass, speed, and soap), and the detergent and rinse are dispensed automatically. This model has a sturdy stainless steel interior and comes with a dish rack and silverware basket. You can successfully wash anything from Tupperware to heavy pots and pans. It’s ideal for any small sized kitchen in an apartment or office. The Koldfront 6 Place Setting Portable Countertop Dishwasher is an efficient energy-saving machine. It uses only 200-kilowatt hours per year that’s about 61 percent less than most countertop dishwashers. It also uses very little water consuming three point eight gallons in a normal wash. But there’s no compromise on quality: the water temperature reaches 149 degrees Fahrenheit, to destroy germs and bacteria; and the powerful spray arm does a thorough wash. This machine holds up to six standard place settings, and the cutlery basket, dish rack, and cup shelf help keep everything organized. After washing, the dishes look spot free, thanks to the built-in rinse agent dispenser. This model is easy to set up, and will save your hours of time compared to hand washing! This dishwasher is Energy Star Certified. ENERGY STAR products are independently certified to save energy without sacrificing features or functionality. Look for the ENERGY STAR label to save money on your energy bills and help protect our environment. Ease of use: DishDrawer Dishwashers are as easy to open and close as kitchen drawers and can be conveniently positioned at bench height for ease of loading and minimal bending. Independent wash: With the ability to use both drawers independently and select different wash programs the DishDrawer Dishwasher can wash everything from fine glass and crystal to heavily soiled pots and pans. True half load: Each drawer holds a true half load for guilt-free small washes and fast turnaround of your dishes. Both drawers operate independently so different wash cycles can run simultaneously to accommodate a variety of loads. Easy to load: Running at a very low decibel rating, these DishDrawe Dishwashers do their job without making a fuss. The combination of intelligent technology and simple mechanics means greater reliability and excellent wash performance. At number one on our list, The Edgestar DWP61ES 6 Place Setting Countertop Portable Dishwasher is great for a family. It has a capacity for six standard place settings and will hold plates up to 10.5 inches diameter, yet, it’s just over 17 tall and fits under most cabinets without the hassle of permanent installation. It’s easy to operate, featuring an LED display with digital controls. The delayed start feature lets you wash dishes whenever you choose, and the child lock will help keep your little ones safe. It’s also an energy saver, using only 200 kW per year. Best of all, it does a thorough job on your dishes! A powerful spray arm swooshes away food particles, and a built-in rinse agent dispenser helps prevent water spots. The water in this machine heats up to 149 degrees Fahrenheit to kill germs and bacteria. You’ll love doing dishes with edgestar. After you have reviewed Top 7 Best Dishwashers in 2019, it is time for you to pick your choice and bring a new member into your home. Price is an important factor in buying stuff, but Quality is a vital point to consider too.